IRON AGE SCISSORS Approx 13cm. We manufacture variety of scissors like conjuctival, eye, iris scissors. These are available in straight, curved and angled form and have sharp pointed tips. 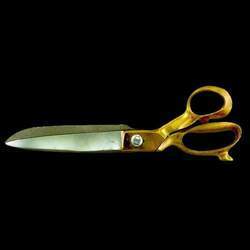 Crown scissors: 10" 11" 12"
We have carved a niche amongst the most trusted names in this business, engaged in offering a comprehensive range of Brass Scissor. Keeping track with latest market trends, we are devotedly engaged in offering a wide assortment of Brass Handle Tailor Scissor.